Craving tacos, but dreading the extra calories and carbohydrates? 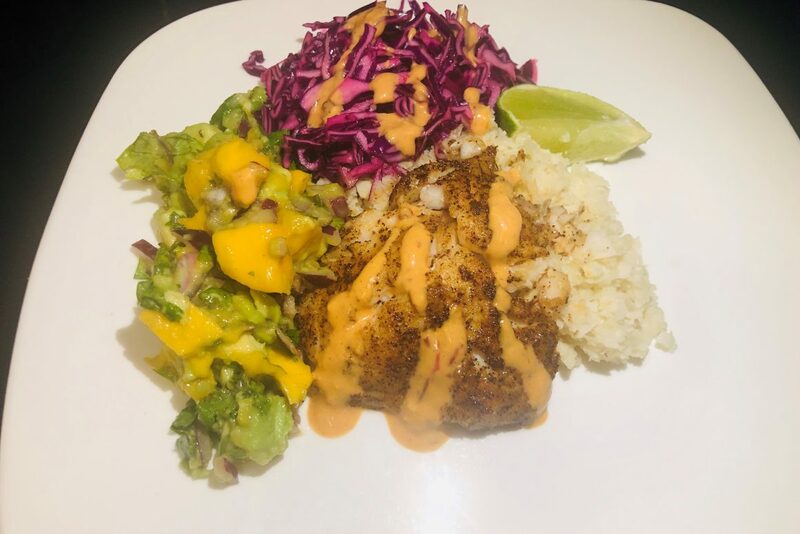 Try out Attune Health nutritionist Natalie Fortune’s taco-seasoned fish recipe! Earlier, we posted an article on phytonutrients, which are multi-colored plant-based compounds. Consumption of these lead to health benefits that range from anti-cancer effects to boosting the immune system. Try this recipe out, and let us know what you think! 2, 4 oz pieces of white fish. NOTE: I used rock fish for this. 1 cup shredded red cabbage. NOTE: I used the slicer attachment on the food processor for this. 2 small mangos. Alphonso mangos work really well here! 1 head of cauliflower. You can buy riced cauliflower, but I put florets of cauliflower in the food processor and pulse until it resembles rice. ¼ cup of dried coconut flakes. Unsweetened. ½ cup of plain coconut yogurt. Note that CoYo works very well. Heat a nonstick pan over medium heat. Add the dried coconut and toast for a minute. Add the riced cauliflower, coconut milk, and sea salt. Mix to combine. Cook over medium heat, and turn to low if you need to while you prepare the other ingredients. Place the shredded cabbage in a bowl. Mix in lime juice and sea salt. Allow to sit while you prepare the other ingredients. Dice mangos and avocados into ½ inch cubes and place in a bowl. Add chopped cilantro, lime juice, sea salt, and diced red onion. Mix to evenly coat ingredients. Again, you can set this aside while you prepare the other ingredients. While the food processor is running stream in olive oil and continue to blend until a smooth sauce is formed. Season both sides of the fish with sea salt, cumin, and chili powder. Heat a skillet over medium high heat and add 1 teaspoon of avocado oil. Lay the fish in the pan and allow to brown. When the fish has browned and is not stuck to the pan, flip and allow to cook on the other side. After you flip the fish you can turn the heat down to medium low. Plate your coconut rice, with the fish and top with the cabbage, salsa, and sauce. Enjoy!